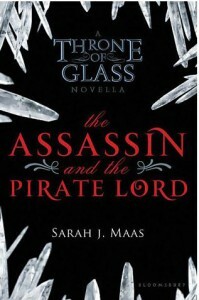 After hearing so many positive things (prior to publication) about Throne of Glass, I was expecting a lot from the first prequel, The Assassin and the Pirate Lord, and boy was I disappointed. I typically have little to say about short stories and novellas—just read my embarrassing attempts at writing a review for the various short-story collections I've read—but there is a lot to say about this one and none of it is positive. This story was a miss in terms of writing and characterization. The novella was filled with grammatical errors and awkward sentences that were hard to follow even when they were grammatically correct. The dialogue was unrealistic and often times cheesy. This was a classic example of telling instead of showing. Not only was there a lot of telling, much of what is told is actually contradicted by what is shown. For example, we're told Celaena is a good liar but throughout the story she constantly casts suspicion on herself by her failure to disguise her true feelings. Overall, the writing was very juvenile even for young adult literature. Even more problematic was the characterization. We're supposed to believe that the protagonist, Celaena, is the most fearsome assassin in the world, yet she doesn't actually kill anyone in the novella despite having ample opportunity and no shortage of enemies. Instead she renders her opponents unconscious by hitting them on the head with the pommel of her dagger (because she's "an assassin not a murderer"—her explanation not mine). She admits to killing people for adultery but finds it morally questionable to kill slave traders, which makes absolutely no sense. She doesn't even kill the main villain despite the fact that he has zero redeeming qualities and he gives her no reason to spare him. In addition to her failure to kill anyone, I found Celaena to be very unlikable. She is bratty, vain, smug, and foolish. Her personality made it even more difficult to believe she was a skilled assassin. After reading this novella, I am no longer excited to read Throne of Glass. My only hope is that these issues were improved upon by more careful editing in the novel.